Why is this one so big, you ask? I've decided to do a few larger paintings and thought I would post this gigantic one (for me)! 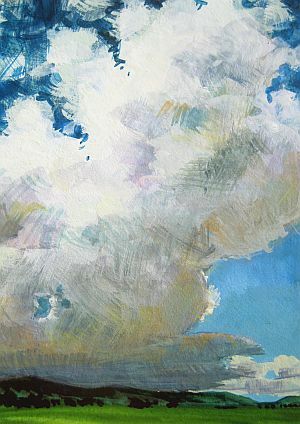 It's 5" x 7" and was done as a demonstration for a class I taught this week on Gouache Basics. I posted a plea for some sky photos on Facebook, and my buddy David Patterson came through with a gorgeous shot of an area not far from the old homestead in the mountains above Albuquerque. I suspect I could drive you right to that same place, I know Highway 14 so well. I really enjoyed catching the arching sky and clouds above the high mountains on a sunny spring day. Such a sweet place, and sweet memories for me. 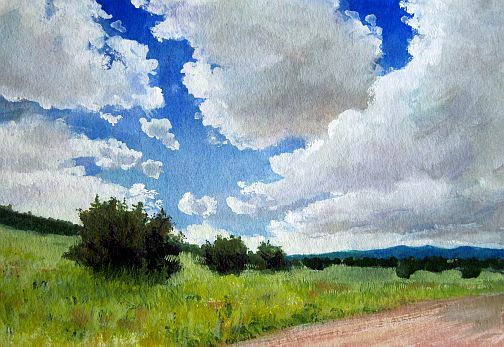 I've decided that I'll do a short series of maybe 9 or 10 paintings of the sky in which I plan to use the same kinds of brush strokes as you see in this one. I like the idea of letting them stand and when I do a series it usually challenges me to find out what works and what doesn't. For now I'm going to keep these back and not offer them for sale so that I can see how the idea progresses. I love the colors and transparency of this one, which is on Illustration Board. It's been so dry but the roses are prolific this year. 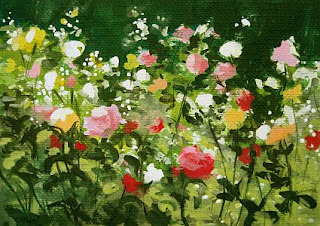 I wanted to catch the delightful snarl of dense bushes covered with flowers. I'm using a new set of gouache I picked up recently, made by Holbein. They are pigment rich, giving me the bright pinks and yellows effortlessly. I had to grab my Hookers Green from the M. Graham stash, however, to get that rich dark green.